Chennai's most loved auto driver is redefining customer experience through a wide range of Service. A commuter on a busy street flags an auto-rickshaw down. He asks the driver to take him to an office situated in a major tech park. The auto driver nonchalantly replies, "One and a half meter." The commuter is aghast, as he asks, "Why one and a half? It's just 9 am and the office is located in a prime part of the city." The driver replies curtly, "There is too much traffic and I won't get a passenger for the return journey." The confused commuter exclaims, "It's the biggest tech park in the city, surely you will get a dozen commuters on the return journey." The driver smirks and retorts "then find another auto" before he drives away without waiting for a reply. This could be a scene from any city or town across India. Many commuters across the country will nod in agreement as they have experienced some form of this situation during their daily commute. Generally, auto drivers are an ostracized lot. Society perceives them negatively, and many believe that the drivers have themselves to blame for the bad reputation. The common grouse that many commuters have is that they are unreliable, rude and greedy. Either they decline a ride or they demand excess fare, and more often than not they don't have the proverbial change to tender back — leading to arguments, threats and even fisticuffs. 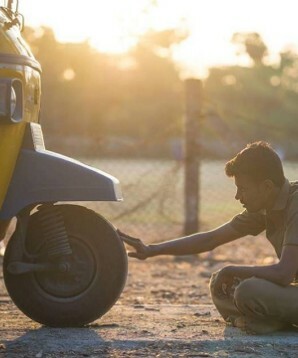 But before you're tempted to make a sweeping negative generalization — we would like to introduce a unique innovator of change — Mr. G Anna Durai, who will change your perception about auto drivers. Anna Durai is an auto driver who is dispelling every negative stereotype associated with his profession by redefining commuter experience through a range of customer friendly services. G Anna Durai aka Auto Anna is a shared-auto driver who plies his trade in Chennai. He lives in Injambakkam with his parents and siblings, and he typically services the Old Mahabalipuram route — which is the hub of most IT companies. After he dropped out of class 12, he didn't have many options to make a living. Driving a shared-auto was one of the few professions that he could see himself doing successfully. The fact that he went well beyond being successful is the story that we would like to recount here. Customer satisfaction is the by-word of all corporates. Every year, companies spend millions of dollars to train their staff on customer service skills that will have their customers coming back again and again. These companies, headed by Ivy league college alumni, place a premium on customer service and find it a constant challenge to maintain excellent customer service ratings. With just a fraction of the knowledge and costs of these big corporates, Anna Durai has revamped the whole idea of customer service and gave them a lesson in customer satisfaction. He has been invited by Vodafone, Royal Enfield, Gamesa, Hyundai, Toyota, IIFL, and Danfoss to address their employees on building customer loyalty. Passion and dedication to his profession coupled with a dose of creativity have helped Anna Durai provide a range of customer friendly services. Reams of newsprint and digital data have already been used to list the number of services he provides. 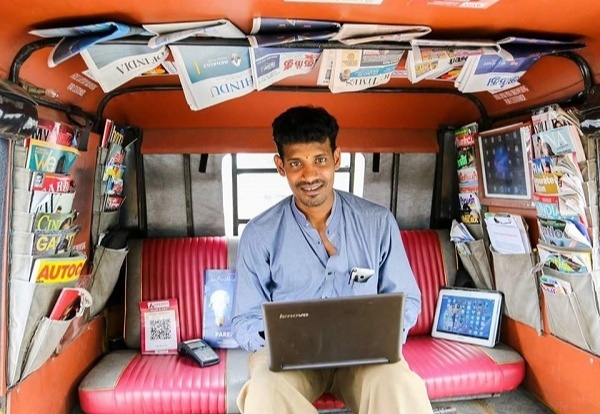 For starters, his auto-rickshaw comes with a free Wi-Fi, and you don't need to have your own device to access it. Anna Durai's auto is equipped with the latest tablet, Ipad, and laptop. For those customers who like to be entertained, he's installed a television set, and he's also got a ready playlist of popular songs at their beck and call. For the benefit of voracious readers, he's stocked his auto with nearly a dozen daily newspapers and more than 40 popular magazines. If that doesn't impress you enough to hop a ride in his auto, then he's got more in store for you: he holds a monthly customer relationship contest which requires his commuters to answer five questions, at the end of the month, one lucky winner is picked to win Rs. 1000. To top this, he hands out tokens to every customer who boards his auto, once a customer collects 20 tokens, they can redeem it for Rs 250. The customer service industry functions on the principle of empathy. Anna Durai exemplifies this principle to the core. One of the common problems that commuters face is the paucity of change to tender: when Anna Durai didn't have the required change, he used to ask his customers to pay him next time, but he noticed some of them feel guilty because they owed him money. 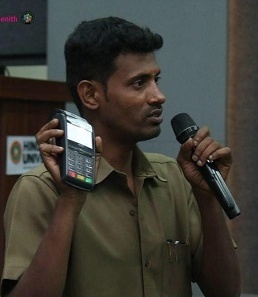 To resolve their concern, he installed a swiping machine — customers can now pay him with any credit or debit card. His empathetic nature covers even the most basic of human sentiments: during his sojourns outside his home state, Tamil Nadu, he would often be engulfed in a state of total bliss and comfort when he unexpectedly heard Tamil songs being played. To make his out of state customers feel the same, he's got a ready list of popular songs from all major Indian languages. Anna Durai's endeavor to make his customers happy knows no bounds. He offers free or discounted rides on Mother's day for mothers with children, on Father's day for men above 45, on Children's day for all students, and on Valentine's day for couples. Furthermore, he offers free service to all teachers as he believes that they lay the foundation for a good future, and he also offers free service to all nurses who work with HIV patients. The desire to do something more for his customers was the trigger that eventually made him the most loved and most popular auto driver of his city. Anna Durai started this whole journey by adding a collection of newspapers every day. Encouraged by the positive response he got from his customers, he went on to add more and more goodies. Eventually, his services started getting widespread attention, and he was invited to talk at the Weekend Leader’s Friends of Positive Journalism (FPJ) members’ social in 2013. That particular speech went viral all over the world, and he became a celebrity overnight. He's now got more than 8000 Facebook followers, and he's also launched his own website. He's delivered two Ted talks and has given more than 40 speeches in corporate offices. This tech-savvy auto driver has also launched an Android app that allows his customers to track his auto's location, check seat availability and book a ride. His ultimate goal is to sponsor children's education and open an old-age home to take care of elderly citizens. Going by his track record, so far, it's just a matter of time before he achieves them, too.